So how should we start? A little of our personal history? My sister turned me on to the book Fun Home years ago and when she saw it was being musicalized, we made a point to see it at the Public. The next year, we went back to see the Broadway version at Circle in the Square. And now the tour. And the productions are different, at least physically. I can't remember, did they re-record the cast album? Mine just says "original cast recording" and I think I got it before Broadway. They did. The original cast album, released in 2014, opened at #2 on the Billboard Top Cast Album Chart, a remarkable feat for an Off-Broadway cast album. 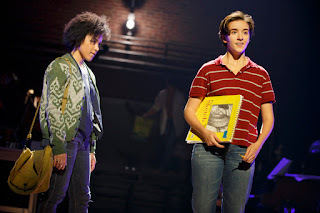 After the musical opened on Broadway in 2015, new portions of the show were recorded, and parts were re-recorded, especially to feature Emily Skeggs in the role of Medium Alison. It also includes more dialogue to help the listener follow the story. I wasn't familiar with the book until I heard word of the off-Broadway production. I think I got the cast recording around the time it came out and read the book (along with the book more about her relationship with her mother) later. I saw the show in April after months and months of anticipation. I was very struck with how invested all the actors were, and how happy they seemed to be doing the show, and at this point it had been for more than a year. How does the tour proscenium set/direction compare with off-Broadway? I think it’s interesting how they adapted the show for the tour. It has much more of a set than either of the previous versions. It was pretty bare-bones at the Public as I remember, and then of course Circle in the Square is in the round, so there was very little in the way of set, just the props. 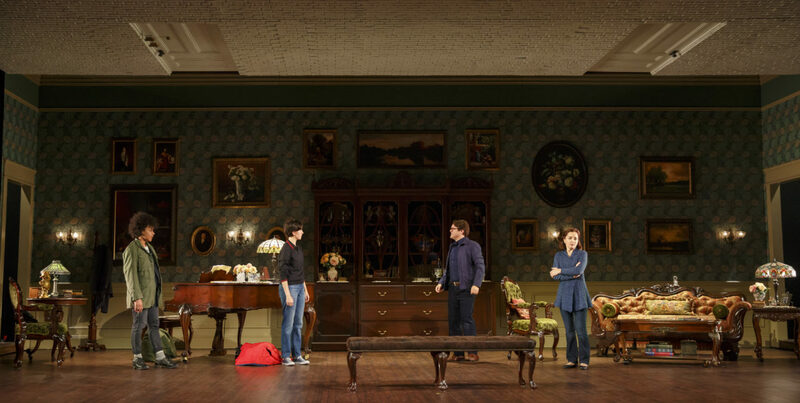 The brick wall that is the backdrop for NY and Oberlin is new, as is the reveal of the realistic-looking Bechdel home. My friend had some thoughts about the set, too, but what did you guys think? The beginning of the tour production pretty bare-bones too, with the back wall of the theater visible, and I love an on-stage band! I wasn't sure about dropping the wall of the house, I don't think it's necessary, but it grew on me. In a way it serves to sort of bring the story in and make it more intimate, and claustrophobic. And I especially like when it was removed and we left Alison's memories and went back to her drawing room. Yeah, I didn't think that it really took anything away from it. I liked that in the reveal of the Bechdel home the wallpaper was the same that Bruce was holding in an earlier scene. The one thing that I didn't really like was using the projection of the book at the end instead of actually going on the father's legs like at the beginning. I believe that is how it was staged at Circle in the Square and was more powerful for me. Beech Creek scene in Fun Home - scenic and costume designs by David Zinn. I liked the upgrade of the home set, and I felt like we were seeing it as Joan was, for the first time, after hearing about it for so long, just like we in the audience were. I didn't mind the projection, I'm glad they just did it once at the end and not throughout. In general projections should be used sparingly. Laura you're observant, I totally missed the wallpaper! Beth's take was that given the time that passed between the earlier scenes and the last one at the house, it had gone from a "work in progress" to something more finished. And that the house mirror's Bruce's life, in that he's building something that looks beautiful and wants to be admired for it, but that the trappings of the house, like his marriage, become overwhelming. Yeah it was interesting because in the end he is at and singing about the house that he is fixing up and still is a mess but the backdrop is the house that he was already “completed." That's why I didn't take credit for the idea. Not mine, but I can see the point! I noticed the wallpaper, too, Laura! I feel like there were more projections in the off-Broadway production. Possibly at the points where Alison is drawing and narrating. I think there was more of her work. But there wasn't anyplace to project it at Circle in the Square. For me, I liked the bookending of the real airplane game at the beginning and the cartoon at the end representing Alison's good memories of her father. I remember there being some projections in Circle in the Square, but they were on the floor, so much more subtle. Yeah I loved the ending, that despite all the dysfunction, abuse, neglect, there were a few moments of perfect balance. As you get older you realize your parents did the best they could, they're just humans who make mistakes like the rest of us. At the end everyone was leaving, and I just needed some time to take some deep breaths. I still think the Orpheum is too big of a house for an intimate show like this, but where I was sitting (Row O) it was fine. Not sure how it plays in the back of the house or up in the balcony though. It's a dilemma, you want as many people to see it as possible, but at some point it's detrimental to the show. Exactly, in a way by paying more you can sit closer and create the "intimate" experience that you want and does aid to shows like this, but it doesn't change the fact that the show is designed and directed for such large houses. But I do think that most theaters that touring shows go to are larger than the largest broadway house by about 500 seats, which is just insane to me. I think it's always a gamble to put small shows on tour when most tour venues are so much bigger than Broadway houses. (Laura, great minds think alike!) I think I was in Row N. I wouldn't have wanted to be further back or in the balcony, though. What did you think of the acting/directing/singing? I thought the cast was terrific. Having listened to Michael Cerveris and seen him twice, I missed him, but Robert Petkoff did a great job. Medium Alison. Photo by Joan Marcus. I thought medium Alison was amazing. I didn't see Emily Skeggs but I liked her more than whoever I saw on Broadway. I thought the cast was every bit as good as the one I saw on Broadway. Agreed on Abby Corrigan (medium Alison). It was strange not seeing the original (and for the most part only) cast, but once I got past that I thought it was a solid group. I love how just about every character gets their song, their moment. It's truly an ensemble piece. Before I went my friends were asking me what is your favorite part that you are looking forward to seeing again. And I couldn't think of just one thing. I think when we first saw the show, they had extended and Alexandra Socha (original medium Alison) had left, and Emily Skeggs had taken over. I have to say, I had forgotten how painfully awkward medium Alison is at college and when she first meets Joan. I felt her angst, and cringed, it's such a good depiction of an awkward time of life. Yeah when does the awkward time stop? I'm about 7 years out from medium Alison. I'm 24 years past medium Alison and I still frequently feel like that! I thought the three Alisons were wonderful, and I loved each of them in their solo turns, but I would say my favorite part is at the end when all three Alisons are singing at the same time. On the recording, it's called "Flying Away (Finale)." I would think that they have to. Yep, the understudies and standbys tour. It is very rare for them not to be in shouting distance of the theater until the show is well underway. I think being an understudy or swing would be totally nerve-wracking. You get maybe 12 hours of rehearsal, maybe not even with the full cast, but you have to be ready to go on and give a performance that will make the audience forget they're not seeing the star. So much pressure! There is a really good documentary about people who are standbys for people like Nathan Lane (the celebrity Broadway star). I haven't seen that one either. The Standbys. Will have to check that out. Oh, and the other thing I wanted to mention was that the band was terrific. I think sometimes I forget about the musicians because they're not front and center, but this was a good group, and gave great support to a strong cast. Can we give a shout-out to the 90 minute no intermission musical?! Not only does it get me home to bed at a decent time, but I love that they tell the story in the time it needs to be told, even if it's not the expected length, and doesn't have an intermission to sell more drinks. I wish more shows would follow suit. Yes, plus for a show like this it would be a crime to take you out of the emotional action and then make you dive right back in. It wouldn't be able to have the same impact. Jules - ugh! So often I feel that intermission is just an interruption that takes me out of the story, and it's sometimes hard to get back in. And of course, I love women's stories told by women! Although I guess the director is a man. But I'll take it. Credit is deserved for a Tony win for the first women songwriting team. Also Lisa Kron's first musical and attempt of writing lyrics. So impressive! 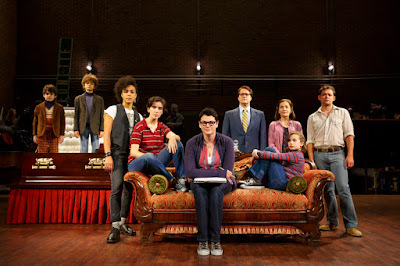 Another recommendation is the podcast Broadway Backstory, they chronicle the creation of Fun Home really well. Absolutely, all credit to all of the female creators of this piece. Very hard to believe it's Lisa Kron's first musical. I think they did a great job of creating a musical and lyrical vocabulary that really fits the story. Although since you mention drinks, I have to say that I strongly disapprove of the HTT's choice to sell caramel corn in rattly wax-paper bags during this show. There was a woman down the row from us who was being really obnoxious with it. It's such a quiet show, and I got really tired of hearing the crinkle, crinkle crinkle during what should have been silence. (And then when my friend asked her to stop, she got belligerent and said she should talk to the theater, since they sold the caramel corn.) Why can't people behave in public? Sit quietly for 90 minutes and listen. It's not that hard! This is a digression, but last night at Bradley Greenwald's superintimate Open Eye Figure Theatre show the person next to me was loudly crunching on candy or cough drops or ice or something. It was sooo loud in that space! He wasn't even miked! Ugh, Jill, I feel your pain! I actually wish theaters would not sell drinks with ice in them, or at least not let them back into the theater. Maybe we should have a separate post on theater etiquette. Anything else we need to cover? My last comment would be this: In the age of revivals and jukebox musicals and movie adaptations, it's so wonderful to see a new original musical that isn't the same old formula, but continues to move music-theater into the future. The other thing I wanted to say about Fun Home touring is that despite the drawbacks of putting it in a bigger house, I'm very glad that this show in particular is being seen outside of New York. I think there are probably still a lot of people in the audience who wouldn't think to go to a "gay musical" if It hadn't won all those Tonys. And this story is so personal and human but also so relatable! Hooray for new work coming out on tour! I hope it gets a positive reception. Yay for new musicals touring the heartland! Although our Minneapolis/St. Paul theater audience is much more sophisticated than most other stops on the tour, I'm sure. Jill, our theater audience is pretty awesome, but as Laura and Carol and I discussed earlier tonight, sometimes the audience at the touring shows isn't all that well-versed in theater, and they don't know what they're going to see. The tour show audience as opposed to, say, the audience who sees the smaller, more adventurous theaters. But fingers crossed that with some new blood in the mix, even some of the old dinosaurs are turning it around. Jules - excellent point about the touring show audience. I think some people don't realize that theater exists off of Hennepin Avenue. 😞 But that's why we do what we do! And yes, Jill! It's totally why we do it. 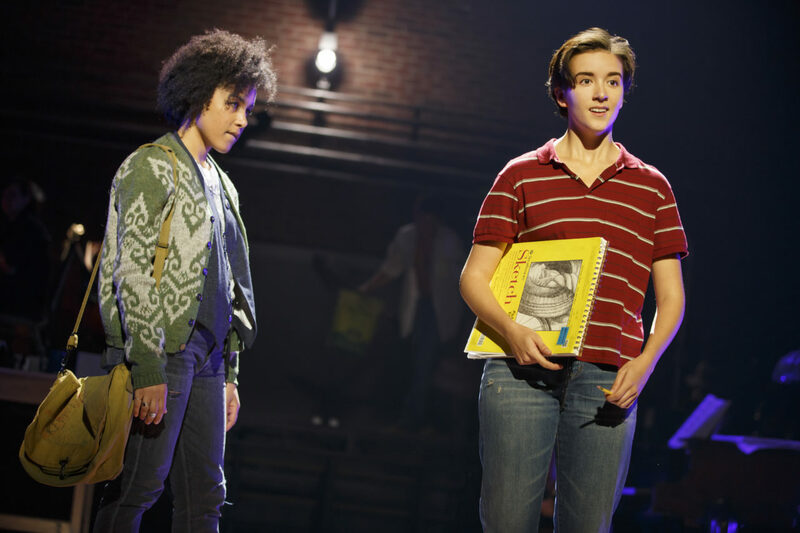 Catch Fun Home at the Orpheum Theatre through December 18.